Air Asia India is much closer to taking wings. The airline, with the reputed brands: Air Asia and Tata, lending it wings, begun conducting simulator checks at CAE Bangalore, a few days ago, for Airbus A320 type rated and experienced applicants who were successfully through the interview process. Simulator sessions are about half hour each, in which the pilot monitoring (PM) and the Instructor are from Air Asia Malaysia. Pilots are checked on decision making skills, adherence to procedures, and logical prioritization in the face of compound failures and crew pressure. Few successful applicants have already been sent their offer letters. Interestingly, the call sign used in the simulator sessions was “Tata1”. If this is any indication of the call sign that will be used operationally, it will serve as a proud reminder, every single day, of the family that brought civil aviation to this country: the Tatas. Things are expected to further shape up next month, into something more tangible. 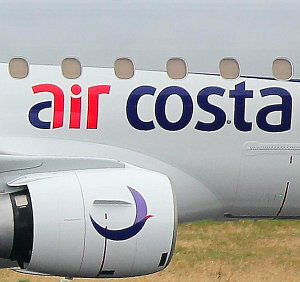 Air Costa got two Embraer ERJ 170s at Vijayawada (one of them VT-LSR, the other’s registration yet unknown), and their incomplete website allows you to choose these destinations and origins: Vijayawada, Bangalore, Hyderabad, Vizag, Chennai, Ahmadabad, and Pune. Job postings calling for “Embraer 170 Captains and TRI/TRE” confirm the two initial bases: Chennai and Vijayawada. 2013 is going to be an interesting year when two initially South-India focused (and Chennai based) carriers take to the skies, further dividing the market, and waging a stronger war for a large share of the market’s airspace. Are they hiring Zero hours rated guys as well ? ?